WOW! It is amazing what you can create with some paint, creativity and a whole lot of talent! I have been seeing more and more painted clothes lately. It seems to be popping up more and a lot of it with a high price tag attached to it! The funny thing is, for us "artists", this is every day wear for us and we didn't pay a thing for our clothes to look this way. All the paint, glaze, plaster and other product on our clothes is just a result of our hard work from our jobs. Take a look at the photo on the upper left. 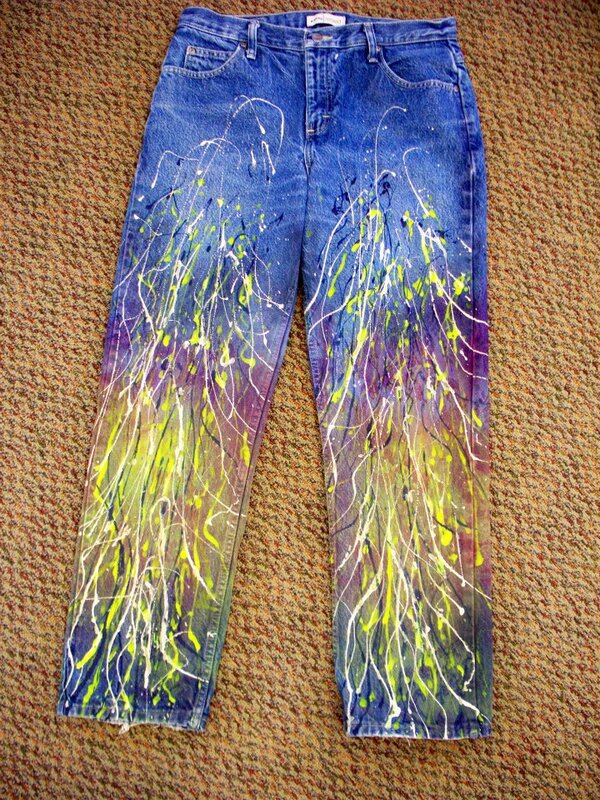 The paint "designs" on these pants is more contrived than the random splats and smudges of an artists/painters work pants, but just goes to show what a pair of heals and a Gucci bag can do for them. How about the second photo? 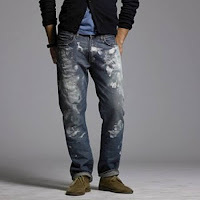 How many of us painters/artists can pull a pair of jeans out of our closets that look just like these $285 J.Crew jeans? I think I am going to buy a price sticker book for my clothes today! Recently, I asked artists in the FauxCetera Facebook group to create a work of art on their own clothes. Something that they consider sellable. The result was some very beautiful and creative takes on what the contest submitters did. Here are some posted below. The winner of the painted clothes contest Allyce Lees, said her inspiration was stirred by the photo posted of the lady wearing the painted pants, heals and a designer bag. (top photo) Allyce said after seeing the photo she had to give it a try. Allyce said, "Obviously I went a different way with my pattern than the photo...but I just got started and let the project speak to me as I went." Allce has an art background and with her husband, Tedd (a painting contractor by trade), they opened up The Paint Store, Inc., in beautiful downtown Waupaca, Wisconsin n 1998. Click here for more pictures and Allyce's step by step instructions. Dawn Moschell-Gibson said her inspiration was the fuchsia color of one of her favorite flowers. 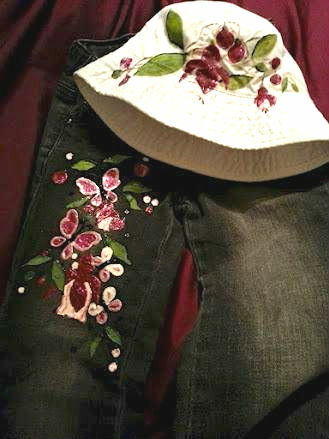 Her granddaughter Sarah always helps her water them, and with her in mind, Dawn set about creating on not only jeans, but on a hat as well. 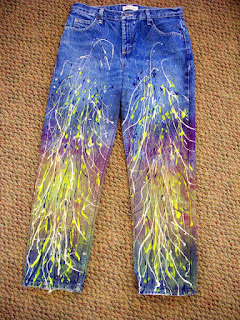 Dawn used regular craft paints and fabric paints. Dawn says, "You can use regular artist acrylic paints watered down and you will get a water painting look. You have to be careful because it is a little hard to control. Then you iron it to set the color in. It works really well and the colors stay really vibrant." 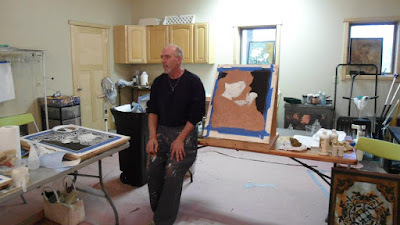 For years people have approached Diane Corso with those sometimes amusing questions like...Are you a painter? When she tells them she's an artist their faces turn to the look of astonishment! Then if she puts a clean shirt on with her painted pants, it gets even more interesting, it's the question of where did I get my painted pants. Diane said, "Inside my head, I think if only you knew, or c’mon follow me for a few days and you will have a pair too!!! Then when you pause a second more and think about the material on my pants, LusterStone, VP, Glazes, Metallics, Not inexpensive material either, of course people are going to want your pants!!!!" Diane tells about her contest entry. "When Kathy posted her contest, I had to say I was inspired, because I really do not own that many pieces of clothing without paint. I went to a consignment shop in search of a piece of clothing that would inspire me to paint on it. To tell you the truth I didn’t even look at the jeans, I started fishing through the store and there is this white cotton dress, clean canvas in my mind! I have a lot of crappy pieces of clothing but the store manager and I start talking, and I'm telling her about the contest, and she gets very excited about my idea to paint the dress, she also asked me to bring it back and show her when I have finished with it, because she might display it, to show her customers what they can do with the gently used items. Some to are to die for because it’s a high end consignment shop!" After talking to the manager of the clothing shop Diane got really to get home and start designing and painting her new dress. She wanted to incorporate her passion for photography, flowers and bugs, and had been looking for a way to pull them together. Hence the butterfly dress! Note: Diane is meeting with the clothing store managers. They love the idea of a painted clothes section! Click for more on Diane's painted dress process. 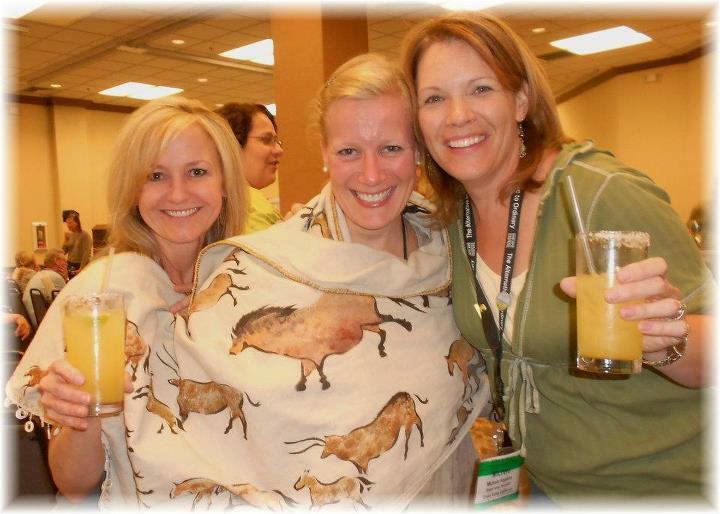 Depicted below is a shawl Eva Gallant created especially for the 2012 IDAL convention painted apparel contest in Reno NV. The shawl is a linen/cotton blend, stencil by Jan Dressler, acrylic colors by Golden, bauble trim by Hancock Fabrics with trimmed edging, hand sewn with Native American sinew. 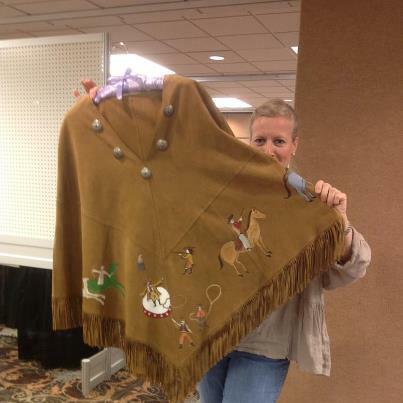 Out of a great number of contenders, the shawl won best of show. Eva (pictured middle) and her winning shawl. As an American raised in Europe, Eva knew at a young age that she had a talent for bringing color together in unique ways. Her art is a culmination of extensive travel… But most of all she has been inspired by the native people to whom she owes so much. Here is one of Eva's works in progress. Creating fascinating decorative finishes from a small palett of colors, Eva Gallant transforms walls & rooms into personalized masterpieces. As a member of IDAL, Eva has received instruction from acclaimed masters of their profession, as well as creating her own unique line of wall finishes & designs. In her repertoire, one will also find exquisite furniture/cabinet finishes & decorative concrete designs as well as her latest addition - "Wearable Art" named YKC Full Circle. I absolutely love the painted pants!! Is there anywhere i Can purchase a pair like that? I live in Rhode Island and would love to grab a pair.